I am going to hazard a guess and say this has something to do with it. Your computer isn't good enough so consider an upgrade. 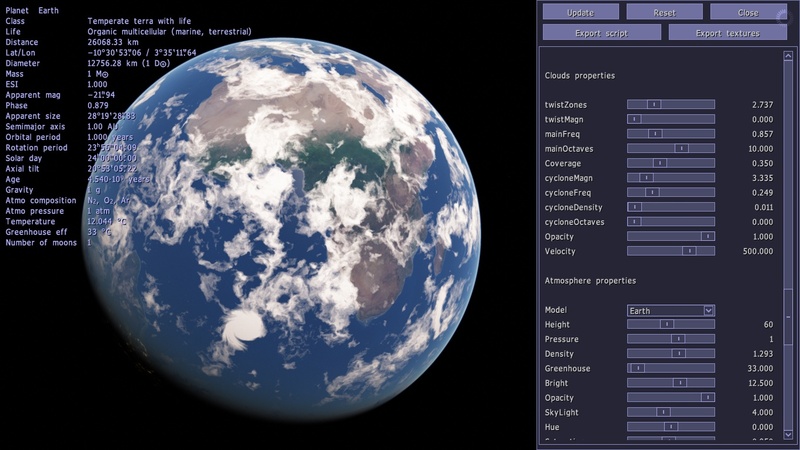 SpaceEngine requires OpenGL 3.3 so you will need a GPU that supports that. If you are on a laptop then your only choice is most likely to buy a newer laptop with more up to date hardware. If by some chance you are on a desktop with that intel chip then buying and installing a new GPU is pretty straight forward. meellis1998, please try to use more sense when posting. You should ATTACH your log, not paste it, and if you simply must paste it, put it inside a spoiler. Also messages consisting mostly of emoticons are no better than spam and are not allowed. I wonder if some of these planemos will be isolated asteroids in interstellar space. I'm not sure if this is a bug, but the twistMagn tag doesn't effect the look of the clouds. twistMagn tag doesn't effect the look of the clouds. I think the problem is your trying to edit earth. I don't think any edit can change earth's clouds. No, he clearly gave Earth procedural clouds and is editing them. I noticed that when I edit planets and such, I can't change the land/sea or the the clouds for some reason. This is possible only if they will not move, and by cost of performance/memory impact (of course). Also, how to find them? The map and star browser will be spammed by them completely. This should exist, because for rogue planet system I used the same code which generates a moon system. 4.- In the new engine's system there can be also trinary planemos? Planemos should follow also the hierarchical structure of multiple-stellar systems. Maybe there are binary rogue planets that orbit other binary for example (a quadruple planemo). 5.- I assume that the perturbations of the nearest objects are neglegible so that the hill's sphere of a plenemo shoould be huge! This means maybe moons with semi-mayor axis of tens of AUs for example. 1 AU is limit for now, until I find some scientific work about that. BTW some works says what significant percent of planemo should be solitary, because they lost their moons during planet-planet scattering event (the only way for planemo to left star system is to approach another massive planet and being ejecting). This also mean what many planemos are actually former moons.